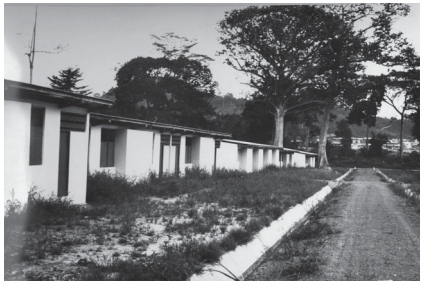 In his article, Miescher details the history of the Akosombo Township that the Nkrumah’s government commissioned in the early 1960s to house the workers for the accompanying Akosombo hydroelectric dam. 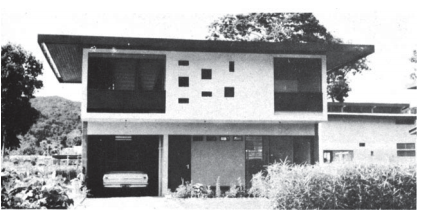 He compares the high modernist visions for the Akosombo township (that Greek Urbanist Constaninos Doxiadis designed) versus the reality that lived out over the years as local workers and their families moved in and brought their own knowledge and lifestyles. The dam and Nkrumah’s modernist agenda has attracted past scholarship, but the visions and experiences of the township’s residents have been ignored. Almost immediately the resident’s modes of living clashed with the official plans as rural workers brought families and animals with them into the city planned for single industrial labors. A makeshift “shadow city” known as the “Combine” sprang up as they tend to in planned modern cities in developing nations (Brasilia), resulting in contention between its inhabitants and the VRA (Volta River Authority) who wished to level it to preserve the model city. Eventually the Combiners were relocated (with the support of the national government) and provided with a slab of concrete and building materials to construct approved housing in an orderly, new, and visually sanitized community. Just because a city does not fulfill the original (often high modernist) vision laid out for it does not automatically doom it to failure, and Miescher does a great job not following into the easy mistake of tossing Akosombo into the pile of failed planned African cities just because it did not follow the original vision of Doxiadis to a T. What I think separates Akosombo from the pile is that there was a continued dialogue (even if contentious at times) between its residents and the government and instead of the Combine simply being torn down, a solution was arrived at that seems reasonable and allowed the city to continue functioning and serving its residents. The other day I was reading Philip Harrison’s article (On the Edge of Reason: Planning and Urban Futures in Africa) in which he draws on post-colonial theory to arrive at a theoretical approach to planning in Africa that balances planners’ desires for efficiency and order with the wisdom found in the “multiple rationalities” of local residents of the Global South. The abstract notion of what Harrison wrote seemed to be sensible, but he was only able to point to Johannesburg as what to avoid, which made reading about the concrete example of Akosombo’s success extremely refreshing. This is the kind of project that planners can build off of for future African cities, striving for what Miescher calls “high modernist local knowledge.” And is why historical awareness and a long view of history is essential to planning.